A set of four soft, black and white patterned activity balls. 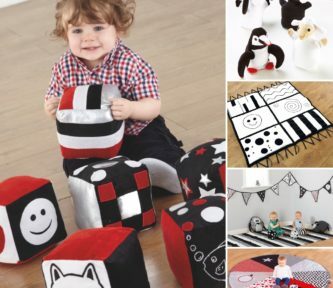 Babies will love playing with this velvety soft collection. Find out which ball squeaks or which one jingles. The bold, contrasting patterns are designed to stimulate and engage. Surface wipe clean. Our Response Please accept our apologies. The stitching should be robust and last. It would appear that this particular product is faulty. Could we ask you contact Customer Services on 0800 318 686 to arrange either an exchange or full refund?